What are the origins of Masonry? reemasonry is one of the world's oldest and largest fraternal societies. It provides a code of living in today's society based on moral and ethical standards. Freemasonry is an organization of men who strive to live by the fundamental principles of integrity, goodwill and charity. It is a non-profit organization that is heavily involved in supporting charity and community service. reemasonry is a society that unifies men of high ideals, regardless of color, creed or worldly status. t is largely believed by academics and scholars that Freemasonry formed out of medieval stonemasons' guilds. These guilds were responsible for designing and constructing glorious cathedrals and impressive castles. Masonry's formal organization began in 1717, when four lodges combined in London to create England's first Grand Lodge, which survives to this day. Masonic lodges can be found in almost every community throughout the United States and Brothers from all over the world are welcome into the lodges found spanning the entire geopgraphy of inhabitable Earth. any of our nation’s early patriots were Freemasons--George Washington, the Marquis de LaFayette, Benjamin Franklin, John Hancock, Paul Revere, John Paul Jones, Rufus King, James Otis, Baron von Steuben, and Joseph Warren--as were 13 signers of the Constitution. Fourteen Presidents, beginning with Washington, and 18 Vice-Presidents were Masons. Five Chief Justices of the U.S. Supreme Court--Oliver Ellsworth, John Marshall, William Howard Taft, Frederick Vinson, and Earl Warren--were Freemasons, and the ranks of Masonry have included a majority of Supreme Court Justices, of Governors of States, of members of the U.S. Senate, and a large percentage of members of the U.S. House of Representatives. amous Masons include Simon Bolivar, James Boswell, Robert Burns, Edward VII, Giuseppe Garibaldi, George VI, Goethe, Rudyard Kipling, Haydn, Mozart, Will Rogers, Sir Walter Scott, Jean Sibelius, Voltaire, and many others. oday, the more than four million Freemasons around the world come from virtually every occupation and profession. Within the Fraternity, however, they all meet as equals. They come from diverse political ideologies, but they meet as friends. They come from virtually every religious belief, but they all believe in one God. o. Members are encouraged to speak openly about their membership. Like many other organizations, though, meetings of Lodges are held in private. o. Freemasonry is not a religion. Men of many different religions are Masons. There is nothing in Freemasonry that conflicts with a member's religious beliefs and practices. owever, to be a Freemason you must have a belief in a "supreme being". Traditionally there is a bible in all Lodges but provisions are made for the presence of other Holy Books, according to the beliefs of members. This is because Freemasonry is truly a non-sectarian organization. ost Masonic Lodges meet at least one evening a month to conduct their regular business and vote on petitions for membership. It is here that the bonds of friendship and fellowship are strengthened. 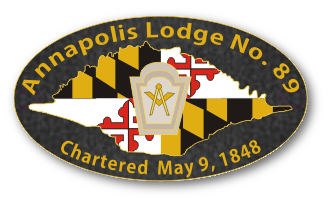 Annapolis Lodge #89 meets on the 1st and 3rd Mondays each month. he Freemasons of America contribute more than one million dollars every day to charitable causes which they, alone, have established. These services to mankind represent an unparalleled example of the humanitarian concern of this unique and honorable Fraternity. ome men are surprised that no one has ever asked them to become a Mason. They may even feel that the Masons in their town don't think they are "good enough" to join. But it doesn't work that way. For hundreds of years, Masons have been forbidden to ask others to join the fraternity. We can talk to friends about Masonry. We can tell them about what Masonry does. We can tell them why we enjoy it. But we can't ask, much less pressure, anyone to join. here's a good reason for that. It isn't that we're trying to be exclusive. But becoming a Mason is a very serious thing. Joining Masonry is making a permanent life commitment to live in certain ways. We've listed most of them above—to live with honor and integrity, to be willing to share with and care about others, to trust each other, and to place ultimate trust in God. No one should be "talked into" making such a decision. o, when a man decides he wants to be a Mason, he asks a Mason for a petition or application. He fills it out and gives it to the Mason, and that Mason takes it to the local lodge. The Master of the lodge will appoint a committee to visit with the man and his family, find out a little about him and why he wants to be a Mason, tell him and his family about Masonry, and answer their questions. The committee reports to the lodge, and the lodge votes on the petition. If the vote is affirmative—and it usually is—the lodge will contact the man to set the date for the Entered Apprentice Degree. When the person has completed all three degrees, he is a Master Mason and a full member of the fraternity.